The PM doesn't want to comment on the investigation. Prime Minister Justin Trudeau arrives on Parliament Hill on April 24, 2018 in Ottawa. OTTAWA — All the answers Canadians are seeking about this week's deadly rental-van attack in Toronto may not be forthcoming, Prime Minister Justin Trudeau said Wednesday, as he once again offered his condolences to the families of the victims. But when asked about the emerging theory that misogyny may have played a role, Labour Minister Patty Hajdu responded by saying it's time Canadians speak up about what she called a troubling trend of hate directed at women. While questions still persist about why a man used a rental van to ram pedestrians on a busy stretch of Yonge Street sidewalk, killing 10 and injuring 16, the families of the victims might not get the answers they want to questions of motive, Trudeau said. 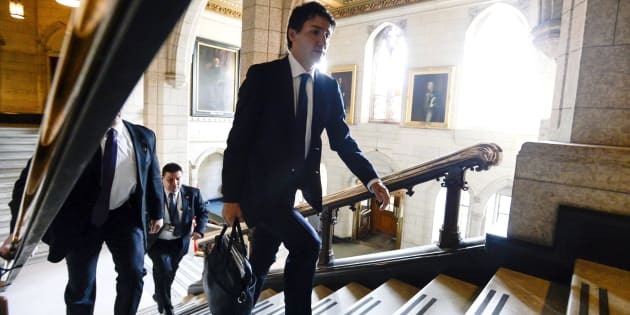 "Obviously, the investigation is ongoing and I'm not going to comment on various aspects of it," the prime minister said as he entered the weekly caucus meeting on Parliament Hill. "But a lot of people have questions as to why, and there may or may not be actual answers," he warned. Police are investigating a message allegedly posted by the 25-year-old suspect, which suggests the attacker may have been targeting women. Alek Minassian is charged with 10 counts of first-degree murder and 13 counts of attempted murder. Hajdu, who was at the caucus meeting along with Trudeau, said people are too silent about misogyny and it's time society spoke up. "From my perspective, we have to have a conversation about misogyny, about the rise in hate and the connection to what some call the alt-right," said Hajdu. "I think it's a conversation that's just not being had loudly enough in our society." A statement from Hajdu's office later sought to distance her remarks from the ongoing investigation. "The minister respects the ongoing investigation the police are doing and agrees it is inappropriate to comment on it," Carlene Variyan said in an email. "She was simply speaking in broad terms, from her experience as status of women minister, about the impacts of misogyny on society writ large. She was not commenting on the ongoing investigation." Authorities have not yet released the names of the 10 people killed in the attack. Trudeau wouldn't say whether he would attend a weekend memorial for the victims, but does plan to visit once he feels he would not distract from the investigation.